Long time no see! Or should I say blog. Sorry about my long absence. I went on vacation down to the smokey mountains for the last week. If you follow me on instagram then you may have received a slight nature photo bomb from me. If you don’t follow me on instagram and you want to, my user name is misshollyberries! Please come find me! I went down to North Carolina for a week because my dad got married. He wanted a mountain destination wedding and he really loves the mountains in North Carolina. We go on vacation there every year and I love it so much too that I might have to move there some day. One huge negative about that area of North Carolina is that there is no cell reception. Also, the internet connection wasn’t the best. So I couldn’t blog and also was a little busy hiking, zip-lining and tubing down a river to even change my manicure. Again, sorry its been so long since I’ve blogged, but I’m back and ready to show you guys a few manicures! Now onto the polish! I was at CVS browsing the nail polish selection when I saw a stand of New Wet ‘n Wild Spoiled polishes. I think they are a fall collection because there were 5 polishes grouped together. I wish I could remember the name of the collection. I tried googling it but nothing came up. The polishes I saw easily could be like how Sinful Colors releases some collections, where they recycle colors from the permanent line rather than coming up with new formulas for every season. This is my first Spoiled color! Not that I haven’t wanted to try others, but an unfortunate part of being nail polish obsessed is that you start to get a ton of polishes that look exactly the same. I really am trying to only buy polishes that are completely unique and that I don’t already have in my collection. I saw the other polishes on the stand and thought to myself that I have most of those colors already from other brands. And then I saw this one and my heart stopped. It looks so similar to a Deborah Lippmann Polish I’ve had my eye on for a long time, Ray of Light. I don’t think they are exact dupes after looking up swatches but they are similar enough that I think I can curve my appetite for Ray of Light for a while. 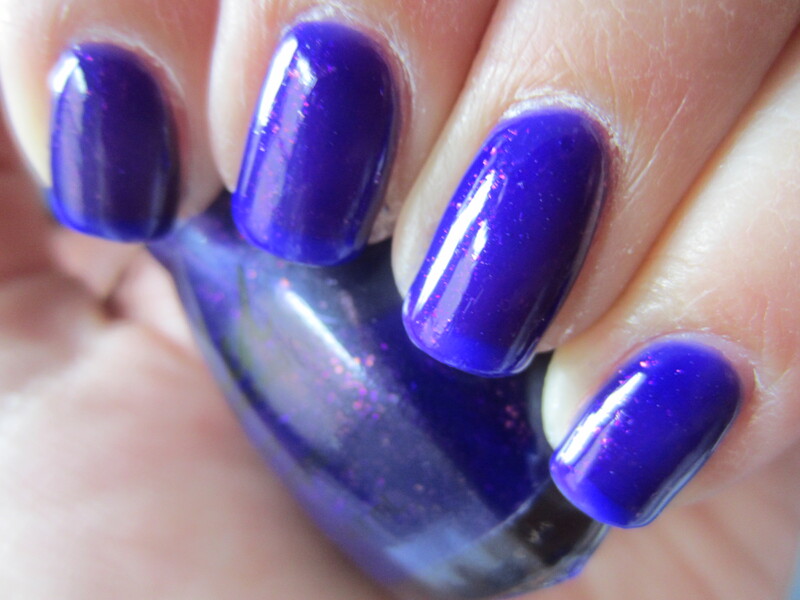 Spoiled “Checkin Into Rehab” is a deep royal purple jelly with small gold flakes suspended in it. But the gold flakes don’t always show up gold. Since they are shining through a deep purple base they turn out lighter purple, pink and gold. My pictures don’t do this polish justice. It is subtle, and no one would notice the depth to this polish, but I couldn’t stop staring at my nails when I had this on. 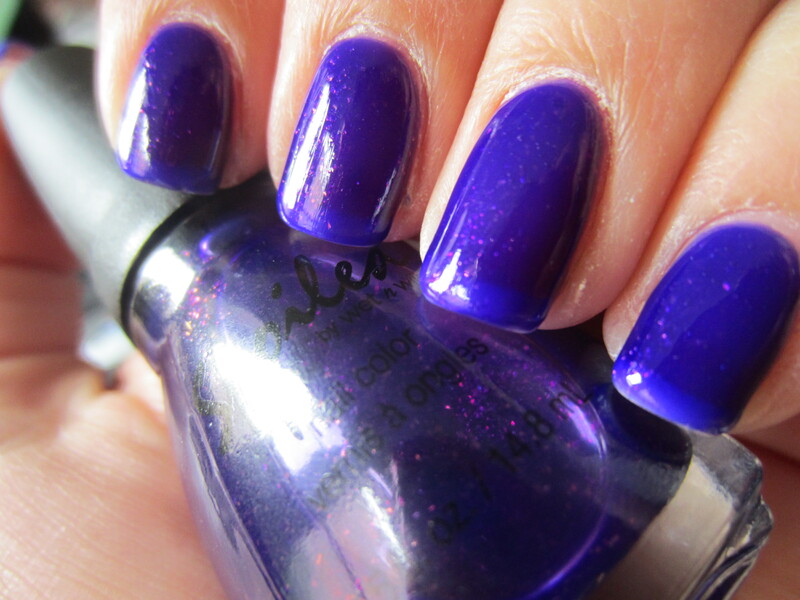 And since its a jelly, it has that depth and dimension that you don’t get from a standard creme finish. The negative to this polish, it took 3-4 coats to get it to look like this. I have a slight disclaimer here because I have on a french shellac manicure on underneath this polish so once I knew that I wasn’t going to cover up the white tips. But this stained the crap out of my shellac manicure. 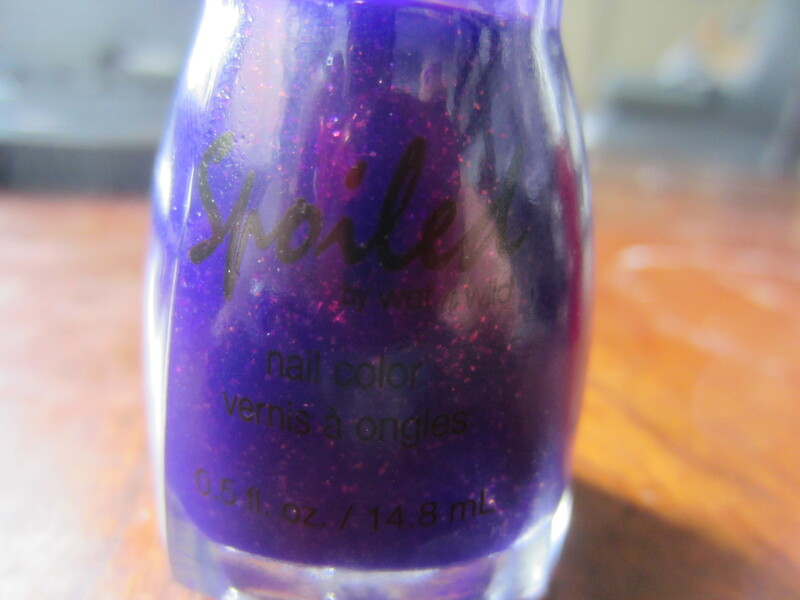 I haven’t tried this over nakey nails but it stained my OPI “Bubble Bath” base for my french to a medium toned purple. It looked kind of cool to have light purple tips with a medium purple base after I took this off but I was planning on wearing the french shellac manicure to my dads wedding. Needless to say, I couldn’t do that anymore and had to continually paint over the shellac. This is such a pretty color and I think I’ll definitely get some great use out of it for the fall. What do you guys think? Have any of you tried this polish? Or any of the Spoiled polishes? Sounds like you had a great trip! I went down to the Smokey Mountains a few years ago and loved it! Congrats to your dad, too! 🙂 I’ve never tried Spoiled polishes since I don’t live near a CVS. One of these days I will hopefully get to one.